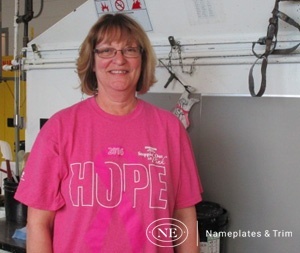 Our employees are what make Northern Engraving and our customers successful. They reflect our core values of Trust, Respect, Innovation, Service and Teamwork every day. It is their hard work and dedication to excellence that make a difference. One person who displays these values is Shari Qualy at our Spring Grove, MN location. Mixing the inks to match the customer specific requirements for each job is a skill that takes time to develop. Each project brings new and interesting formulas to get the colors just right. Shari is one of our team members in the Ink Lab and meets this challenge each day with a positive attitude and a smile. “Nothing is mastered overnight. You have to give yourself time to learn the ins and outs of what you are doing, especially when working with ink mixing. Getting the color perfect can be a challenge! It only gets better as we each hang in there and learn together. I have enjoyed getting to know the people that I work with and making new friends. For over 105 years, Northern Engraving has been manufacturing decorative trim and nameplates. We are proud of the employees who work here and appreciate each one. Together we make a difference for our customers. This highlight of employees celebrating milestone anniversaries shines a light on our most valuable resource, our people.